Oleksandr Kharchenko, Managing director of the Energy Industry Research Center in an exclusive interview with UNIAN commented on the statements about the coming changes in Ukrainian energy market, earlier voiced by Arseniy Yatsenyuk in Washington, D.C. and during his address to the Verkhovna Rada of Ukraine. On July 17, during an Hour of Questions – a regular Q&A held in the Ukrainian parliament – Prime Minister Yatsenyuk stated that the Frontera Resources Corporation plans to build an LNG-terminal in Ukraine. The memorandum was signed between the top managers of Naftogaz and of the US partners on July 13, during a Business Forum in Washington, D.C. In your opinion, will this project finally be realized? It can work out, but just as a small project that will complement the Ukrainian market with small volumes of gas. However, it is impossible to say that this project is vital for Ukraine today. It is just one of the many projects, no more than that, one more option of gas supplies to our country. Why not? As the investment project, it is useful for Ukraine. *** The project of constructing an LNG-terminal has gained popularity in the days of the government of Mykola Azarov. The State-owned Gosinvestproekt led by Vladyslav Kaskiv has been lobbying it. The culmination of the process was the signing of the contract on the construction of the terminal by Gosinvestproekt on November 26, 2012 with the Spanish Gas Natural Fenosa, which later denied any involvement in the project, while its supposed representative Jordi Bonvehi appeared to be a "ski instructor." In a follow-up to the scandal, Gosinvestproekt decided to attract the US-based APCO Worldwide. But then the idea of a project was rejected, and it was frozen. Why did the project lose its relevance? Today, we are absolutely sufficient in diversification of gas supplies. We can already pump nearly 60 mcm of gas daily from Europe. The main problem of Ukraine is not in a technical, but rather financial support of this process. That is, we have no money to pay for gas. Another fact, which the prime minister mentioned is that a memorandum had been signed with the European division of the US company Riverstone on increasing purchases of gas for Ukrainian industry. What should we expect from this news? It is also a project aimed at further development of the gas supplies diversification program, it’s 100% positive news. That is, now we have one more supplier. I know that Naftogaz has been very active and consistent in seeking new suppliers, correctly building up a trading strategy. But, again, today it’s all about the lack of money, Ukraine’s ability to pay for gas. I think it is one of the reservations. Ukraine has already adopted a law on the gas market, which is now being implemented. Apparently, that was the reason why the statement was voiced that a private operator would be working with industrial customers. There probably are some signed contracts? Maybe, but I can’t answer this question. I guess, the supplier will be focused on major buyers and will not work with small purchasers. Speaking about the foreign companies entering the Ukrainian market, Yatsenyuk noted their interest in the privatization of our energy assets. Is it OK for Ukraine to go along with it? Energy assets should be sold to foreigners; the faster, the better. And it is not about re-privatization, but only about the privatization of additional assets – those which are now owned by the state, yet used inefficiently. Another energy news, but this time, from Naftogaz. The US company TrailStone plans to start providing services on purchase and sale of natural gas on the Ukrainian market this autumn. What are the advantages for Ukraine and how will it affect Naftogaz? In fact, foreign companies entering our market increase competition, which is a positive thing. That is, entering the market by another major operator with advanced technologies, with the understanding of how to buy and how to sell. And in any case, along come the investments. Even to set up the sales process, one needs some amount of money – to create jobs, to hire people. And again, the more traders, the greater the competition and the lower prices. And we, as buyers, are interested in it. Naftogaz is now actively working to increase competition in the market. It stimulates the process of new traders coming to Ukraine. Firstly, Naftogaz, even in theory, should not close up everything, and secondly, it is also interested to work with honest partners. After all, the gas market is not as simple as it seems, it is quite sophisticated. Ministry of Energy has asked the European Commission to assist in the negotiations with Russia on gas supplies from Kazakhstan and Turkmenistan. Can we achieve our goal? Technically, to receive gas from these countries, we can only transit it through Russia. There is a contract, signed a few years ago by Gazprom on purchasing all of the Turkmen gas in bulk. But recently, Turkmenistan said that Gazprom did not comply with the contract, made no payments, and almost announced a technical default in Turkmenistan. Interpretation was changed, because Moscow responded politically. But the real situation is that Gazprom has nowhere to sell its own gas, given the situation on the world market and the Ukrainian market, which Russia has actually lost. And it is clear that Gazprom is not happy with having to buy more gas from Turkmenistan. What is to do with it? Therefore, the situation is very complicated for Gazprom. But they still remain stubborn, not allowing transit of gas through the Russian territory. Ukraine’s appeal to the European Commission is a request to put pressure on Russia on the issue of gas transit from the Central Asian republics. Of course, it is advantageous. It would allow one more dealer to offer its product to Ukraine, which could lead to further price reductions. As for Kazakhstan, there’s no so much gas there. And, again, it would only have to be transported through Russia. So will putting pressure on Russia work out? Central Asian gas seems to be another political tool of Moscow? Will it be a dragging issue? It hasn’t played any significant role in the past few years. And I don’t think the situation will change quickly. Russia may refuse transit, as it is the Russian territory, and there is nothing we can do there. Well, we managed to organize gas supplies, there’s just no money to pay for it. 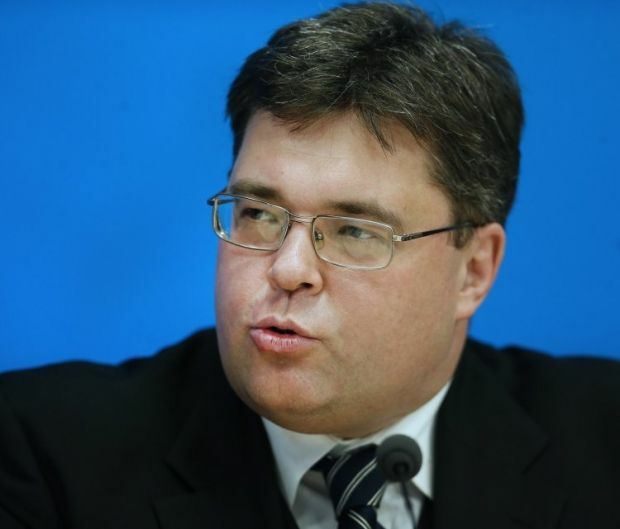 Energy Minister Volodymyr Demchyshyn said that Ukraine expected to receive funds by September from international donors to pump gas into underground storage facilities, but the final agreement has not been reached. By the way, negotiations have been lasting for over a year. Head of Naftogaz Andriy Kobolev voiced the necessary amount of money - $1.5 billion. So far, only the European Bank for Reconstruction and Development (EBRD) announced its intention to allocate $300 million for reverse gas flow. Will we get help? The amount announced by Kobolev is correct. But that's not the point. We are talking about the volume of gas to be pumped into Ukrainian underground storage facilities. In winter, when Europe buys more gas than it is physically possible to transport through the pipe, the needed additional volumes of gas are delivered to Europe. So, where is the logic? Russian gas is pumped into storage facilities, then it is delivered to Europe. Ukraine doesn’t actually profit that much, but in the winter we also consume more gas, so we can partially compensate in such a way. But personally, I really don’t quite understand why Ukraine should pay for all of this gas. This gas is bought by the Europeans from Russians, to consume it in Europe. So why must Ukraine pay for this gas to be pumped into the storage? Finally we took the right position: What does it have to do with us? And we let others decide how they are going to pay. Either let Russia pump this gas in storage facilities, and then the Europeans would pay for consumption. Meanwhile, they would also pay Ukraine for storage. This is an option that is called transfer of gas at the border, as we have said many times. The second option: Europe pays for pumping gas into underground storage facilities. And it will also work. It is justified for us to tell the European Commission that if they want gas, we need money for it, or they can directly negotiate with Russia, and this is not our problem - it is their problem. I’d also rather not talk about the professional qualities of our minister of energy. Who is more interested in delaying the resolution of this issue? Both Russia and Europe. They do not want to pay, as it’s already a habit. And this is a normal process. There are dozens of processes, far from normal, so there is no need to focus on this one. The problem does exist. We did not use to highlight it, we just hung all the money on the Ukrainian budget, which is nonsense, actually. Now we have finally started to articulate and communicate it. Thank God, we have. This problem will not be solved immediately. But if we don’t get this process started, it will never be completed. On July 7, Naftogaz sent a request to Gazprom to provide shipper-codes to implement a virtual reverse of gas. Officially, the response was not reported. In your opinion, will Russia take this step? Honestly, I know nothing of the response to this request. I think Russia will not give away the shipper-codes. The next thing we do is go to court, and it’s the only way. If Russia provides shipper-codes, then it’s different thing, though it sounds unrealistic. But if we don’t work in this direction, if we are not ready for such turns of events, then we will not succeed. *** Ukrainian and Hungarian operators of gas transportation systems – Ukrtransgaz and FGSZ – have signed an agreement on the interconnectors, involving the exchange of data on the operations of cross-border gas pipelines. This will eliminate Gazprom from the schemes of gas cooperation between Ukraine and the European Union and let our country switch to a virtual reverse. This mechanism removes payments for transportation of reverse flow gas, and also creates the possibility of using Ukrainian underground storage facilities by the European companies. That is, certain preconditions have appeared for the creation of a gas hub on Ukrainian territory. But, to make this happen, Ukraine needs to get the so-called shipper-codes from Gazprom. That is, the information on volumes of gas transported through Ukraine. The next round of trilateral gas talks was scheduled for the end of July. There is still no confirmation. In your opinion, will there be any? And will they see any progress, unlike the Vienna round? Not in a short term, but in general – yes [there will be progress]. Russia can still flutter for a while, in a political sense. But in fact, it has no way out, and Europe has neither. But it is a better situation for Europe. This is the case when some compromise must be reached. I think that Ukraine, therefore, doesn’t push with the negotiations. UN voted for lifting sanctions against Iran, so it [Iran] will start the supply of oil. By all estimates, the prices will fall, and the gas will be cheaper. Why should we hurry? The officials have repeatedly stated say that in ten years, Ukraine could be no more energy dependent. Do you agree? I think that we can even manage to achieve this goal in seven years, with certain efforts. On several issues: an increase in domestic gas production and a significant reduction in energy consumption, realistic gas prices, modernization of resident buildings and boilers, replacement of networks. Having done this all together, we can get to this goal in five to seven years. Besides, we should be replacing gas for biofuels, which is a clear prospect for Ukraine. Our country could stop importing gas in seven years.